and the sweetness of parsnips...perfect! Apple and parsnip soup is an excellent way to get some of these delicious root veggies, cousins to the carrot, out of the ground and onto your table! It's sort of surprising how many people have never even tried parsnips. Did you know that in Medieval times parsnips had a reputation for being an aphrodisiac? Yeah, you want 'em now, don't you? Seriously, parsnips have a lot of health benefits. They are an excellent fiber source. They're high in soluble fiber, the type that helps lower cholesterol and keep blood sugar level. They're also a good source of folic acid. Folic acid plays a role in reducing heart disease and may help prevent dementia and osteoporosis bone fractures. And they also provide an ample amount of potassium, which aids blood pressure. The flavors in this delicious apple and parsnip soup are really vivid. Wait, can flavors be vivid? Well, you know what we mean. 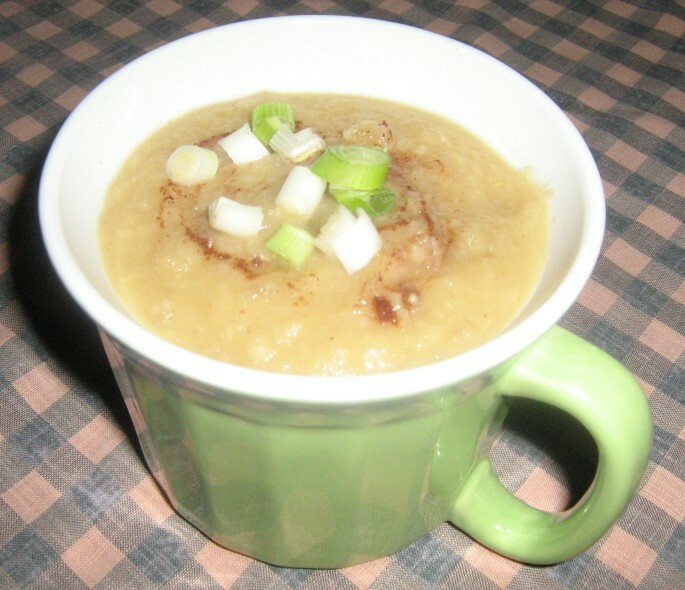 This scrumptious soup has it all - the tartness of apple combined with the sweetness and interesting flavor of parsnips. Those flavors meld together just right to provide a really good, really tasty, really delightful soup. Ok. We really don't want to over-do it with the "reallys" but this is a soup you should rea...ummm, definitely try! Add vegetable broth, apples, and nutmeg. salt and black pepper to taste. Serve hot. Source: The Granville Hotel, Brighton, England. Published in The Best in the World, Neal D. Barnard, M.D., editor.